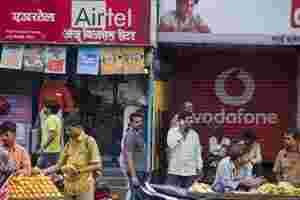 New Delhi: India’s top mobile phone carrier, Bharti Airtel, on Friday posted a bigger-than-expected 38% fall in fiscal second-quarter profit, hit by higher interest costs and losses on foreign exchange and in its African operations. High costs in Africa have kept margins under pressure and Bharti has yet to turn a profit there, while a vicious price war in the ferociously competitive Indian market and costs related to its Indian 3G network have kept its margins subdued. Bharti, nearly a third owned by Southeast Asia’s biggest phone firm, Singapore Telecommunications , said consolidated net profit fell to Rs1,027 crore ($210 million) for the quarter ended September from Rs1,661 crore a year earlier, using international accounting standards. “Negative surprises were limited. On the domestic side, the drop in (profit) numbers and the fall in traffic quarter-on-quarter are roughly in line with a general industry trend," said Manish Sonthalia, a fund manager at Motilal Oswal Asset Management. Shares in Bharti, worth $30.4 billion, traded up 0.8% in a Mumbai market that was up over 1% as of late morning. Bharti said interest expenses in the quarter more than tripled from a year earlier to Rs1,118 crore. Currency fluctuations increased the cost of servicing foreign currency loans, leading to foreign exchange losses of Rs239 crore for the quarter, versus profit of Rs249 crore in the year-earlier quarter. Most of the losses in Africa were due to forex fluctuations, Manoj Kohli, Bharti Airtel’s CEO for international operations, told reporters. Bharti operates in 16 countries in Africa and generates revenue in multiple currencies. However, Kohli remained optimistic for a turnaround in Africa, where Bharti has an internal goal to achieve $5 billion in revenue and $2 billion in operating profit by the fiscal year ending March 2013. “We are making good progress...We are actually more confident," he said. The outlook for the Indian mobile sector has improved after carriers, including Bharti, raised some voice call prices in July by about a fifth, the first such increase in at least two years in the ferociously competitive market after a price war had sent call prices tumbling and squeezed profits. Bharti and its rivals in the world’s second-biggest mobile phone market of about 870 million users are also betting on a pick-up in premium third-generation (3G) mobile data services after they launched high-speed networks this year. On Thursday, the Telecom Regulatory authority of India (Trai) proposed new M&A guidelines which, if implemented by the government, would facilitate consolidation in the crowded 15-player market. Bharti Airtel India and South Asia CEO Sanjay Kapoor said the company would not be “averse" to making acquisitions in India, although he declined to comment on specifics. The decline in September-quarter profits was Bharti’s seventh consecutive quarterly profit drop and was deeper than market expectations. A Reuters poll of brokerages had expected net profit of Rs1,233 crore on revenue of Rs17,258 crore for the New Delhi-based firm, which had 227 million mobile users at the end of September in 19 countries in Asia and Africa. Bharti said consolidated revenue rose to Rs17,276 crore from Rs15,231crore in the year-earlier quarter. Monthly average revenue per user (ARPU), a key metric for telecom carriers, from Bharti’s Indian operations fell an annual 9% to Rs183 for the quarter, while Africa ARPU fell 1% to $7.3. Margins at its Africa operations improved to 26.2%, from 23.2% a year ago. Bharti had net debt of $13.2 billion at the end of September. The company plans to raise another $750 million to $1 billion through a dollar bond issue, but said it will wait until market conditions improve. The company had taken on debt to pay more than $3 billion for 3G and broadband spectrum in a state auction last year. The company’s stock is up 10% this year, outperforming a nearly 14% fall in the broader market . Smaller rival Idea Cellular’s shares have jumped 41% this year, while closest rival Reliance Communications has lost nearly 42% on the year.